About: The fullform of GATE is Graduate Aptitude Test in Engineering. GATE 2019 is a national level entrance exam for admission to PG courses in engineering and technology related fields. Conducting Body: GATE exam conducting authority changes every year between the IITs. There are 7 IITs in this list which include IITs from Bombay, Delhi, Guwahati, Kanpur, Kharagpur, Madras and Roorkee. 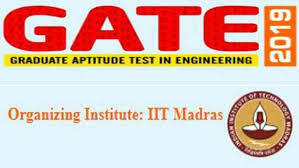 IISc Banglore also conducts GATE exams. Admissions through GATE: Candidates who qualify GATE 2019 will be eligible for GATE 2019 admissions to M.Tech/PhD programmes in IITs, IISc, IISERs, and other reputed institutions. Importance of GATE Score: Apart from being an admission criterion for M.Tech./Ph.D. programmes, GATE 2019 score is also considered for recruitment by the Indian government especially for PSUs and even private organizations in technical fields. The GATE score would reflect the relative performance level of the candidate in a particular subject, which is quantified based on the several years of examination data. GATE 2019 Cutoff: GATE 2019 Cutoff was released on March 15th along with the GATE 2019 Results. Candidates can log in to the official website and check the results. Type of Questions: There are two types of questions asked in GATE, they are Multiple Choice Questions (MCQs) and Numerical Answer Type (NAT). Scorecard Validity: A candidate's GATE 2019 Score will be valid for a period of 3 years. Participating Colleges: Nearly 80 Indian colleges (IITs, NITs & other govt. funded institutions) offering post-graduate education accept GATE 2019 score for admitting candidates to the above-mentioned programmes. Scholarship: To avail the financial assistance (scholarship/assistantship), the candidate must first secure the admission into a program in one of the central government supported institutes. Is GATE compulsory/mandatory for the 2019 batch? Students pursuing technical degree across the country of both government and private institutions might soon have to write mandatory "Exit Exam" in their final year of engineering and pass it to get their degree certificate. The All India Council for Technical Education passed a resolution making Graduate Aptitude Test in Engineering (GATE) mandatory calling it the "exit exam" for engineering graduates in all technical institutions. This decision is concerned about the quality of engineering students graduating every year. The government is proposing to test their “attainment levels” through this examination. Universities and colleges are yet to be formally informed about it. But, AICTE has clarified that it has not yet taken a decision to make GATE mandatory from 2019 or 2020. So, the year from which GATE will be mandatory as an exit exam is still ambiguous, but definitely not from 2019. The GATE administrating authority has decided to add an additional paper of Statistics with subject code ST for the first time this year. Thus, from 2019 onwards, there will be 24 GATE papers instead of 23. Also, this year those who have filled the form but not yet submitted before the deadline will be allowed to submit the application beyond the last date. Gate 2019 results were out by 15th March 2019 and the candidates can download their scorecard in the official website. If a candidate has made a mistake in mentioning the category, then he or she can make correction by sending the right information to gate2019@iitm.ac.in before 27th March 2019. If you qualify GATE 2019, then you will be eligible for taking admissions to M.Tech/ PhD programmes in IITs, IISc, IISERs, and other reputed institutions. Apart from being an admission criterion for M.Tech./Ph.D. programmes, the GATE 2019 score is also considered for recruitment by the Indian government especially PSUs and private organizations working in technical fields. GATE score will be valid for span of three years. 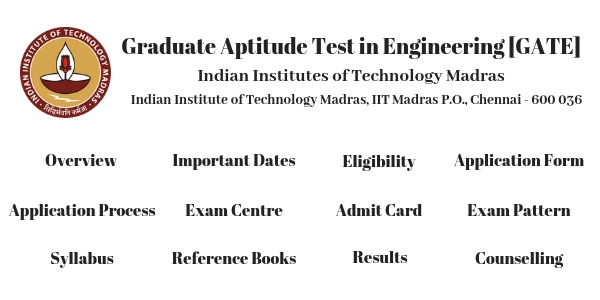 Exam Date: IIT Madras conducted GATE 2019 on multiple dates starting from 2nd February 2019 to 10th February 2019. GATE 2019 Counselling: Counselling of GATE 2019 starts after the GATE 2019 results are announced. The Counseling will tentatively start from 5th April 2019. Result date: The Conducting body IIT Madras announced the results on 15th March 2019. Get more information about the exam dates in the GATE 2019 Important Dates section. Age Criteria: There is no age limit defined by GATE 2019 conducting authority. Minimum Qualification: For appearing in GATE 2019, candidates should have a Bachelor’s degree in the related engineering and science stream; a Master’s Degree in any branch of Mathematics/Science/Statistics/Computer Applications or any equivalent degree. Final year students: Candidates who are in Final year of Degree should obtain a certificate from their college principal for verification to make themselves eligible for GATE 2019. Foreign Applicants: Candidates from Foreign countries possessing a Bachelor’s Degree or Master’s Degree in the related engineering or science stream are eligible for GATE 2019. Get more information about qualification criteria in the GATE 2019 Eligibility Criteria section. Registration: The Candidates have to create a login ID on the official website on the GOAPS (Gate Online Application Processing System) portal for GATE 2019 Registration. An applicant can register for the GATE 2019 between 1st September 2018 and 3rd October 2018. Candidates can fill GATE 2019 Application form only after registration. Fee Payment: The GATE 2019 Application Fee for SC/ST/ Female candidates is INR 750/- whereas for other candidates it is INR 1500/-. The application fee can only be paid in online mode. Get more information about the form, uploads etc in the GATE 2019 Application Form section. Online Interface: GOAPS provides an online interface to the candidate for interacting with the GATE 2019 administration. Step 1: Visit the official website of GATE 2019 to register. Step 2: Enter the personal details such as Name, Email ID, Country as per the document state. Step 3: Create your password where it must contain at least a single string of numbers or alphabets. It should be unique and 8-15 characters long. Step 4: Enter the Captcha provided and Submit for completing GATE Registration. Step 5: If the entered details are correct, an SMS and an email will be sent to your mobile number and email address respectively. GOAPS password must be unique and it is advised to avoid using Date of Birth, their name or some numbers (12345 etc) or string of letters (abcd etc). All communication will be sent to the registered mobile number and email id. In the case of foreign students, all the communication will be done through email. After successful registration, an email containing the GOAPS Enrollment ID will be sent. This ID will be used for submitting GATE 2019 Application Form, downloading GATE Admit Card and for the purpose of checking result and downloading scorecard. Get More information about procedure to apply in the GATE Application Process section. Selection: Every GATE 2019 candidate has to select 3 choices for the GATE 2019 exam centre. Candidates can choose the first 2 exam centres from the same zone and select the 3rd centre from any other zone. Exam centre Allotment: The authorities will try their best to provide a GATE 2019 exam centre in the city of the Candidate's first preference. However, the authority reserves all rights to allocate the candidate an exam centre in any of the three cities he/she has already chosen. Examination centres will be across the country and one has to choose as per his/her convenience. You can change the examination centre by making a request and the change will be allowed by demanding a proper reason from the candidate. Get more information abouttest cities in the GATE 2019 Exam Centres section. The process to Download: Candidates can download the GATE 2019 Admit card by entering their Registration number and Password on the Official website. Issue date: The GATE 2019 Admit Card was available for download from 4th January 2019 on the official website. Step 1: Visit the official website of GATE 2019. Step 2: Click on the link available to download GATE 2019 Admit Card. Step 3: Enter your GATE Enrollment ID and Password. Step 4: Click on ‘Submit’ and your GATE 2019 Admit Card will appear. Step 5: Download and take a coloured printout of the document. Get more information about the hall ticket in the GATE 2019 Admit Card section. Mode: GATE 2019 Exam Pattern is an online Computer-based Test (CBT). Marking scheme: GATE 2019 will have Multiple Choice Questions (MCQ) and Numerical Answer Type (NAT) Questions carrying 1 or 2 marks each in all the papers and sections. For 1-mark MCQs, 1/3 mark will be deducted for every incorrect attempt. For questions that aren’t attempted, zero marks will be awarded. There is no negative marking for numerical answer type (NAT) questions. For more information about exam pattern please visit the GATE 2019 Exam Pattern section. Syllabus for GATE 2019: GATE 2019 syllabus consist of 24 subjects. However, candidates have to write the exam in only one discipline. Candidates are advised to check the detailed GATE 2019 syllabus for the related discipline in order to identify and focus on the important topics to be questioned in the examination. Common Section in GATE 2019: In GATE 2019 General Aptitude section shall remain common irrespective of the discipline, the candidate takes up in GATE 2019. Candidates can also download GATE 2019 syllabus pdf for their convenience from the official website. And the syllabus for the selected branch varies according to the subjects. Get more information about gthe syllabus in the GATE 2019 syllabus section. Process: To access the GATE Result 2019 candidates must log in to the GATE 2019 official website and enter the credentials, i.e registration number and password. Result Date: GATE 2019 Results was declared on 15th March 2019. Step 1: You will have to visit the official website of GATE 2019 Result. Step 2: Look for the link provided for the results of the particular year. Step 3: Enter the Login ID and Password. Step 4: Click on Submit button to access the results. Step 5: The scorecard will be available on the screen as a pdf format. For more information about results, feel free to check GATE 2019 Result. GATE cutoff is the minimum mark that a student has to score to become eligible for admission process. GATE authorities have released GATE 2019 official cutoff after results. The results were out on March 15th 2019. Moreover, GATE scorecard will be available only for candidates who surpassed GATE cutoffs. GATE scorecard will be available from 20th March to 31st March, 2019. GATE cutoff is dependent on three factors. Read more about cutoffs in GATE 2019 Cutoff section. Counselling Date: GATE counselling 2019 process will begin from 5th April 2019 (tentatively). The counselling dates will be allocated to every qualified candidate depending on their score in GATE 2019 examination. Documents Required: Candidates who qualify the examination will have to present certain original documents when they appear for GATE 2019 Counselling Process. Counselling Process: There is no common process for GATE 2019 counselling. Centralized Counselling: For admission in NITs, IIITs and in some government-funded colleges, a centralized counselling– CCMT (Centralized Counseling for M.Tech/M.Plan) is conducted. Admissions: GATE 2019 Counselling is done separately by various IITs, NITs and other institutes. Candidates after having qualified in GATE 2019 have to appear for GD/ PI for admission. For admissions, candidates have to check notification by GATE participating institutes. Documents Required: For GATE 2019 candidates should take the following documents Provisional seat allotment letter, DOB certificate, Passport size coloured photograph, GATE 2019 Scorecard, ID proof etc. Get more information about counselling in the GATE 2019 Counselling section. Organizations accepting GATE 2019 Score: Bharat Heavy Electricals Limited (BHEL), Gas Authority of India Limited (GAIL), Hindustan Aeronautics Limited (HAL), Indian Oil Corporation Limited (IOCL), National Thermal Power Corporation (NTPC), Nuclear Power Corporation of India Limited (NPCIL), Oil and Natural Gas Corporation (ONGC) and Power Grid Corporation of India are some of the PSUs recruit through GATE cut off. Recruitment: Direct recruitment to Group A level posts in Central government, i.e. Senior Field Officer (Tele), Senior Research Officer (Crypto) and Senior Research Officer (S&T) in Cabinet. Public Sector Undertakings: GATE 2019 scores are used to shortlist the candidates for employment in Several Public Sector Undertakings (PSUs). Note: GATE administration is not responsible for employment opportunities. The qualified candidates must check newspapers and other reliable sources for any such information. ID Proof: Candidates will have to produce an original ID proof with GATE 2019 Admit card for verification (For example, employee ID, driving license, passport, pan card, voter ID, Aadhar card or valid college ID). Mandatory Documents: Candidates appearing for GATE 2019 examination must carry the GATE 2019 Admit Card and original valid photo-identity proof to the exam centre. Legitimate Photograph & Signature: Candidates are advised to take a clearly legible, preferably colour printout of the admit card on an A4 size paper. The GATE 2019 Admit card is valid only if the candidate's photograph and signature images are legitimate and are according to the instructions. Reporting Time: Candidates will be permitted to occupy their allotted seats 35 minutes before the scheduled start of the examination. Candidates can log in and start reading the necessary instructions 20 minutes before the start of the examination. Candidates must report at the examination venue 60 minutes before the scheduled commencement of the examination. Candidates shouldn't be late: No candidate will be allowed to enter the GATE 2019 examination hall 30 minutes after the commencement of the exam. Verification of Details: Candidates will be permitted to appear for the examination only after their GATE 2019 credentials are verified by the centre officials. Rough Work: Scribble pads will be provided to the candidates for rough work. A candidate is supposed to write GATE 2019 Registration number and his/her name on the scribble pad before he/she starts using it. The scribble pad must be returned to the invigilator. Hardware Tampering: Candidates should not tamper the computer and related hardware provided in the examination hall. Candidates found tampering these willfully will have their candidature cancelled immediately. In addition, appropriate legal action will be initiated against such candidates. Students belonging to PWD Category who are visually challenged. Q: I will graduate with B.Tech/B.E in 2019. I don't have my provisional or degree certificate. So, how can I apply for GATE 2019? Ans: The candidates who are in final year and do not have provisional certificates, please upload course completion certificate/Final year mark sheets. Q: I am not able to upload eligibility certificate/document even though the certificate is valid as well as between 10KB and 500KB. Can you please help? Ans: Candidates need to clear their browsing history or clear cache of your browser and then try again. Q: As I am B.Tech 2014 passed out, I am not able to fill the year of qualifying degree because the selection year is displaying only 2018, 2019, 2020, and 2021. What should I do? Ans: Please select the “Yes” option for the question “Have you graduated in the above degree?”. This will allow the display of all the previous years. Q: I am a recent graduate with B-tech. I have backlogs. With what supporting documents can I apply for this GATE 2019 exam? Application form Dates: Candidates willing to write GATE 2019 have to first register on the official website of GATE 2019 between application_from_date and 3rd October 2018. Admit Card Issue On 4th January 2019 the GATE 2019 Admit card will be available for download. Exam dates: The GATE 2019 exam was conducted from 2nd February 2019 until 10th February 2019 in two sessions; morning and afternoon according to the allocated slots. Results: GATE 2019 results will be declared on 15th March 2019 and to know the GATE scorecard log in to GOAPS. Age Criteria: As Eligibility criteria defined by the GATE 2019 Conducting body there are no eligibility criteria. Final year students: Candidates who are in Final year of Degree should obtain a certificate from their college principal verifying the same to make themselves eligible for GATE 2019. Foreign Applicants: Candidates from Foreign possessing a Bachelor’s Degree or Master’s Degree in the related engineering or science stream are eligible for GATE 2019. Application date: The GATE 2019 Application Form can be filled via the GATE Online Application Processing System (GOAPS) from 1st September 2018. The details have to be filled in as guided. Registration: GATE 2019 Registration must be completed online on the GATE 2019 official website at appsgate.iitm.ac.in. Fee: Once the form is submitted, students must pay the application fee through net banking, e-challan or debit card. Modification: The candidate must check the details before submission of the form, however, the form once submitted can be modified later by requesting online. Details Required: You have to enter your personal and educational details in the GATE 2019 application form. You must preview the form to verify the information entered and modify the incorrect details immediately to avoid discrepancies later. Selection of Paper: Depending on the discipline of qualifying degree, You can appear for only one paper. Subject Code details: In GATE 2019 you must have to make sure that you enter the correct subject code for the Paper you are applying for. Fee details: For female candidates, the application fee is INR 750. GATE 2019 application fee is INR 1500 for candidates belonging to General Category. Issue date: GATE 2019 Admit Card will be released on 4th January 2019. Download: You can download the GATE 2019 Admit card by visiting the official Website, click on the GATE 2019 Admit Card Link. You will have to enter the Registration Number and Password to generate your GATE 2019 Admit Card. Admit card Content: The GATE 2019 Admit Card will consist of details like candidate’s name, the location of the exam centre, photograph, and signature of the candidate. Verify: You will have to cross verify all the information on the Admit card because any mistakes in it may create problems later. Discrepancies: In case of any discrepancy, immediately report to the conducting authority i.e. IIT Madras. It is mandatory to verify the information before downloading GATE 2019 Admit card. Common section: The General Aptitude section 5 questions of 1 Mark and 5 questions of 2 marks. Negative Marking: Question Papers other than GG, XE and XL will contain 25 questions of 1 mark and 30 questions of 2 marks. There will be Negative marking based on the type of Question and its marks. 1st Type: In the papers of AR, CY, EY, GG, MA, PH and XL, General Aptitude section will carry 15% of the total marks and the rest 85% marks will be carried by the core subject of the paper. 2nd Type: In the papers of AE, AG, BT, CE, CH, CS, EC, EE, IN, ME, MN, MT, PE, PI, TF and XE, Engineering Mathematics will carry 15% marks of total marks, General Aptitude section will contain 15% marks and the rest of the 70% marks will be contained by the core subject of the paper. Subjects: GATE 2019 will be conducted for 24 subjects. Each subject has different syllabus for it. Common Sections: Mathematics section is common for all candidates. The section containing questions on Verbal ability and Numerical ability is common for all candidates. Different Sections: Questions on Technical subjects is different for candidates belongs to the different discipline. Theory and Numerical: Candidates must prepare for numerical as well as the theory of the topics included in the syllabus. Scorecard: Candidates can view their results on the official website of GATE 2019. The Scorecard will not be provided in Offline mode. Date: The GATE 2019 results will be announced on 15th March 2019. Process: Candidate has to visit the official website, then click on the link provided for results, Fill the necessary details and click on "submit" button. The validity of Scorecard: The GATE 2019 scores are valid for 3 years. Want to get in ? Eligibility was GATE appearing and the selection process was CAP rounds. I have given the GATE exam. Actually, in my college there was no cutoff, only thing was a candidate to appear for GATE. The eligibility of my course is 1) class 12th pass with PCM or PCB 2) marks be in cut-off of college 3) they pass from govt or including gov schools. My admission procedure is 1) submit admission forms online of that college that you want 2)wait for cut-off realised 3) submit your all documents like 10th class and. 12th class marks sheets and all. I want to take the gate exam. My course's typical cut off is first cut off, that was 88. 1. The student must have aggregate above 60% and no current backlogs while entering into college. student should not be involved in any irregular activities. valid rank cards of certain examinations on the exams they have taken. 2. For entering into masters we need to take GATE exam otherwise another option is to go through management.for entering into bachelors we need to take EAMCET to get the seat in colleges in the same state. if the student wants to enter into IIT or NIT they must take JEE MAINS and JEE-ADVANCED. In NIT'S AND IIT'S management seats are not available but for universities, there are some integrated courses so they can take management as the option and in local colleges, they make admissions through both EAMCET and management. 3. The cutoff for masters in GATE is 25 based on the marks of topper the college cutoffs will be provided by education board same for B.TECH admissions when I took JEE MAINS exam cutoff is 105(OC) however the cutoff changes for the other castes. Eligibility criteria for M.Tech admission is first class in B.Tech. By ranking according to marks obtained from B.Tech, I got admission for M.Tech in Er&Dcit,CDAC TRIVANDRUM with a specialization of VLSI&EMBEDDED SYSTEMS. I have written the GATE entrance exam, but I couldn't clear the exam. You need to qualify GATE exam before getting admitted for Master course in PDPM, IIITDM, Jabalpur. The cutoffs are different for different stream of Engineering. You have to score in GATE exam for getting admission. Admission was given according to the GATE entrance examination scores and the students who completed B.Tech with minimum 60%marks. It changes from year to year. You should take GATE exam. The cutoff changes from year to year. I want to get admission in BITS, Pilani. Will it accept GATE score for M.Tech? BITS, Pilani does not accept GATE score for Granting admission in M.Tech. Click here to know about the colleges that accept GATE score. What is the last date to fill the application form for GATE 2019? The last date to apply for GATE 2019 is 9th October 2018. Click here to know about the GATE application process. Please give me the complete details of GATE exam? How can I start preparation for GATE? I am in B.Tech first year in ECE. Graduate Aptitude Test in Engineering (GATE) is a national level entrance exam which is conducted for granting admissions to PG courses in engineering. GATE score is used for recruitment by the Indian government and private organizations also. How do I pay the application fee for GATE 2018? The link to pay GATE 2018 application fees has been activated on August 31, 2017. This year, the exam authority allows only online payment for GATE registration. Candidates can opt to pay through debit card, credit card, and net banking. The additional charges such as service charges, processing fees or bank charges have also to be paid by the candidates. I am pursuing B.Sc. Am I eligibile to appear in GATE 2018? If it's a 4-year degree and research course, then you are eligible. If it's a three-year degree course then you are not eligible. Do I have to send the print-out of the application form? Hey, Gaurav thanks for showing interest in GATE 2018. No, the print-out of the application form is not required to be sent to the Organizing Institute (IIT Guwahati) or any other GATE zonal offices. For OBC candidates. Do they have to upload the category certificate? Hi, this is Sateyndra, i wanna know that only SC/ST/PwD candidates have been asked to upload the category certificates. What about the OBC (non-creamy layer) candidates? Do they have to upload the category certificate too? NO, category certificate is required only for Indian nationals (appearing from exam centers within India), who wishes to avail a concession in application fee. As far as the GATE 2018 examination is concerned, only SC/ST/PwD candidates and all women candidates are eligible for application fee concession. If the power or internet connection failed during the submission of form in GATE? what do i do? You don't need to worry Ravindra, just log into the GOAPS website again and continue the application process. Why should I choose three examination cities? A candidate will most likely be allotted a center in the examination city of his/her first choice. Only in cases, where there are too many candidates opting for a certain city as their first choice, the other two choices become relevant. A candidate is required to fill his/her choices of cities to appear in the examination but should remember that because of operational constraints, the GATE committee reserves the right to add a new city or remove an existing one and allow a city that may not be any of the choices of a candidate. Can I appear in any of the GATE 2018 papers? No, You can't appear in any GATE paper. The candidate is expected to appear in a paper appropriate to the discipline of his/her qualifying degree. The candidate can also choose any other papers of GATE 2018, however, it is better to choose a paper in line with the eligibility criteria of the institutions/organizations in which he/she wishes to seek admission/ job.